I’ve never owned a vehicle that’s had any sort of camera built in before so the thought of getting an Elgrand with a factory fitted reversing camera really appeals to me. In fact I like the idea so much that I want to add more cameras. The Elgrand I’ve bought (that’s currently on it’s way to Malta) is a phase 1 E51 which means that it was probably only a year away from getting a facelift when it was built, the facelift included a ‘blind side’ camera fitted in the bottom of the nearside wing mirror. This is a bit disappointing but never mind…I think I have options. Although I can’t check if this is physically possible yet I’ve gone with my hunch that it should, in my head, be possible to mount an after-market camera in each wing mirror. I’m hoping there will be clearance inside for these rather small cameras (below) to be fitted without fouling the motor/carriage mechanism. The cameras I went for are pretty cheap from eBay and are wide-angle colour cameras with the added bonus of being reversing/back-up or front-facing cameras. There are a couple of wires that change the view to have the guide lines or not, and reverse the image, or not. They’re cheap enough that I won’t be too disappointed if they don’t last for ever. They’re also waterproof. Camera with wiring. They even come with a hole saw. They look like they have quite a large angle of adjustment, but in reality the cable coming out of the back of the camera restricts the movement so it’s not possible to angle the camera as far as you’d expect. Quite a sneaky selling trick. I intend to have them angled only slightly so this isn’t an issue. Camera with the wires to set the view type. Having three cameras then poses the problem of how to display three images on a screen with one camera input. Does that mean I’ll have to put in switches to select which camera to display, or is there some clever device to do it automagically? As you’d expect, there’s a gadget somewhere that can do what you want and I found this one on the AliExpress auction site. 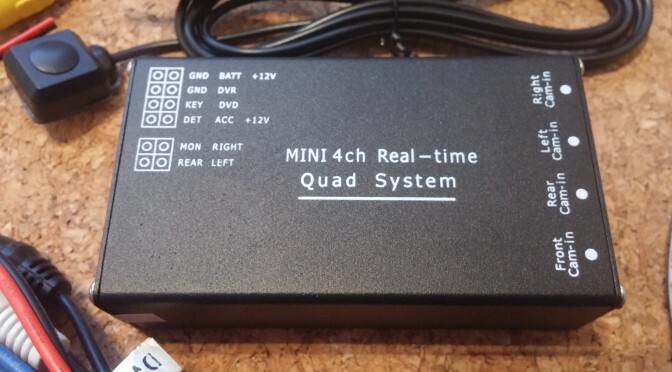 It’s a small box with four camera inputs that can automatically detect how many cameras are connected and mix the video in many different ways, outputting it to a single screen (and/or DVR if you wanted to record the feed constantly). It also has ‘trigger’ inputs to turn individual cameras on when required. The example they give is using the left indicator to turn the left camera on for 5 to 10 seconds, with the indicator flasher keeping it on until a few seconds after the indicator is cancelled. The reversing camera will have a trigger from the reversing light circuit to turn it on. It comes with all the cables needed to hook it up to typical vehicle cameras and a monitor/DVD and includes a push button switch to change modes (the unit remembers the last selected mode across power cycles apparently) or to turn the cameras on when driving. It also has an in-line fuse on the power lead which is a nice touch. It works with PAL or NTSC cameras, but they must all be the same standard. This one took 13 days to arrive and escaped import duty by having a $20 value printed on it (when I bought it it was selling at £42.90 with free delivery). I’m very keen to get it connected up to the cameras and front screen (to confirm it’s all working OK before fitting it) as soon as the van arrives. If this works as expected I’ll buy another camera to mount on the front pointing down so I can see the front bumper when parking.